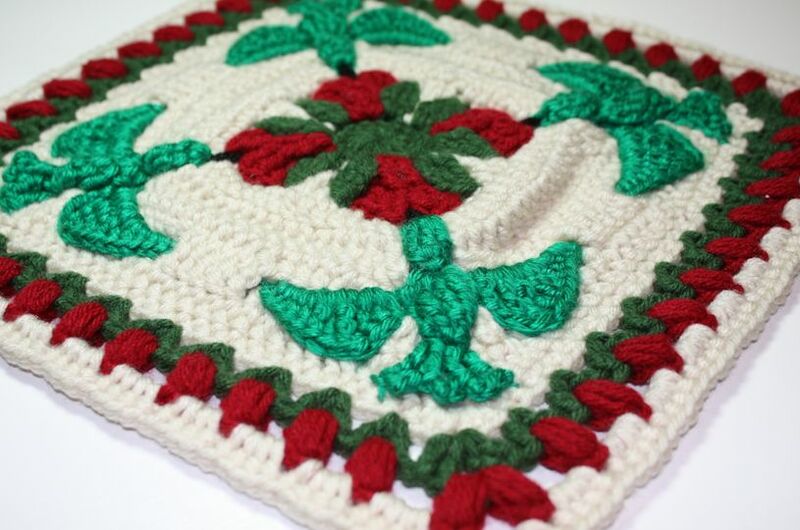 The Easter Afghan Stitch can be made to any size you want or used for any crochet project, not just afghans. For more info or to purchase this pattern at ChelseaCraft Ravelry store just click the photo. Well here it is. My second Easter design project which ran late. As you can see the bunnies multiplied and so did the eggs and baskets. That’s not all that multiplied this Easter! As luck would have it, a stray malnourished pregnant cat took up living in our hedges so I was tasked to get her into the house and try to fatten her up. 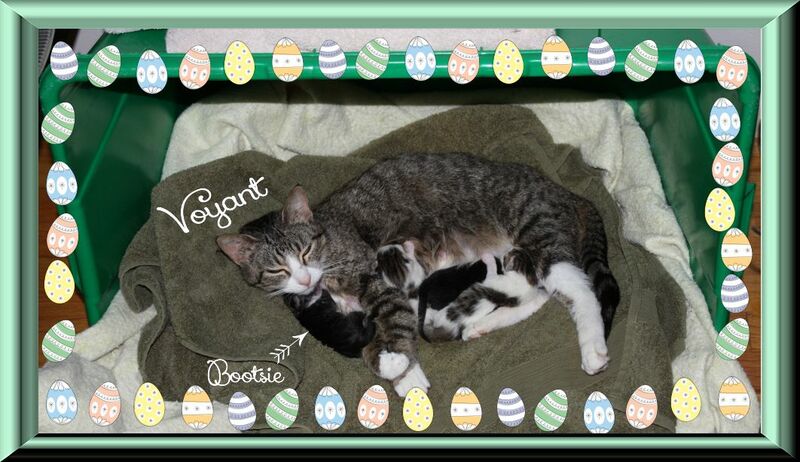 She had kittens the Thursday before Easter (see photo below). That little one I named Bootsie had to be bottle fed because he was too weak. So between all the new cat & kittens ordeal I managed to finish this Easter Afghan Stitch pattern and publish it. It has gotten a bit of attention by one of Ravelry’s editors who some of you may recognize, Kim Guzman. My design made her blog’s “10 Things This Week in Crochet” list. She gave it some nice compliments! I had a lot of fun making this pattern and wish I had the time to make samples of all the neat things you can do with the 3 separate stitches that make the repeating pattern. I got kind of carried away and made a 3rd project of an afghan square with 4 bunnies, 4 Easter baskets with beads for eggs, and a decorative border of Easter eggs. Unfortunately, when the cat made her appearance I quickly laid that aside & stuck to finishing this second project just in time for Easter. I will keep that project & my idea for a panoramic Easter Egg for next year’s offerings for Easter. To purchase the Easter Afghan Stitch crochet pattern from my Ravelry store just click the photo of it. This edging was created for a sentimental old afghan I made about 20 yrs ago from worsted yarn that needed some sprucing up. This photo shows the edging in Red Heart Super Saver Aran color worsted yarn. However, this edging can utilize any thread, cord, yarn… whatever. The pattern and chart are written as a stand-alone edging that you sew onto a main piece you wish to edge. You can omit the chain stitch foundation if you are edging an afghan. At the end of this pattern I have included some instructions for working corners as I did for my afghan project. My edging was made using an G hook for rows 1 to 3. The last 2 rows I used an F hook. The chart shown is accurate for the stitches but you need to follow the written pattern for the flowers because the chart can’t explain how to make the puff flowers exactly. Foundation Row 1 – ch the length you need in multiples of 3. Alternately, if you are edging a square piece, just make sure you have a single crochet row around your entire piece. Row 2 – ch 5, dc in 4th ch, [ch2, skip 2 ch, dc in next ch] for length of your piece. Row 3 and 4 – ch 5, *[2 dc, ch1, 2 dc] in dc, ch2*, repeat between asterisks ** to end of edging and dc in turning chain from previous row. Row 5 – ch 5, sl st in ch 1 space of fan cluster, *ch3, working from front to back, [YO, insert hook into same ch space of fan cluster, YO, pull up a loop to the height of a dc stitch, YO, insert hook in same space, YO, pull up a loop to the same height, keep loops on hook, YO, insert hook under ch2 space between fan clusters, YO, pull up loop keeping height even with all loops on hook, YO, insert hook in same place, YO, pull up a loop in the same space, hold all loops on hook, YO, insert hook into ch 2 space of the next fan cluster, YO pull up a loop to same height as all other loops, YO, insert in same space, YO pull up loop, YO and pull through all loops on hook] (bottom half flower made), ch 3, sl st in same ch 1 space of the fan cluster below you just worked in*, repeat between asterisks ** for the length of edging. Row 6 – ch 6, sl st in sl st in ch 1 space of fan cluster,*ch2, [YO, insert hook from front to back into the center of the petals of your previous flower cluster, YO, draw up a loop to the height of a dc, YO, insert hook again into the flower center, YO, draw up a loop to the same height, YO, pull through all 4 loops on hook tightly] (puff petal stitch made), ch 2, work another puff petal stitch into flower center, twice (3 petals worked completes the flower), ch 2, sl st in the sl st between the flowers*, repeat between asterisks ** for remainder of edging. Round 2 – at each corner end edging with ch 2, work 3 dc, ch3, 3 dc in each corner ch2, then ch 2, and continue edging pattern above. Remember that with every successive round the filet mesh increases by one mesh square (ch 2, dc) on each side of the corner. You may not reproduce, distribute or sell this pattern in any way. You may sell anything you make from this pattern. 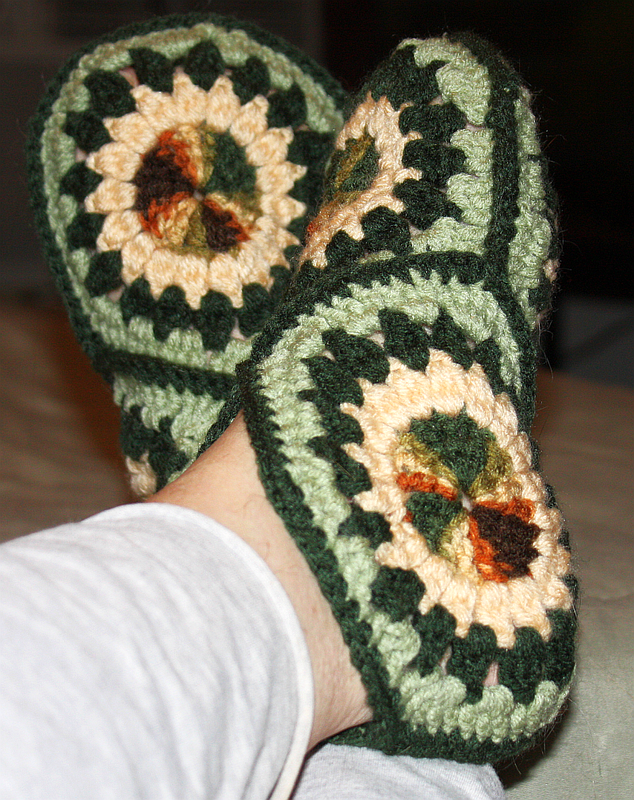 These cute and comfy bootie slippers are so easy to make out of small amounts of worsted weight yarn. They join with single crochet so there is no sewing. There is no separate sole piece to make or try to make fit on like other hexagon bootie patterns. Want ankle boots? Add 2 more hexagons on the top. These are a perfect seasonal gift and seniors love them. If you use the RedHeart Super Saver Yarn they are machine wash and dry and will last quite a long time. I like it when they get washed enough so they become felted. Materials – Red Heart Super Saver yarn. You can use as few or as many colors as you want. If you use only 1 color it takes 1 super saver skein (7 oz). Pattern tells you were to join yarn for color changes but I’ll leave which colors up to you. 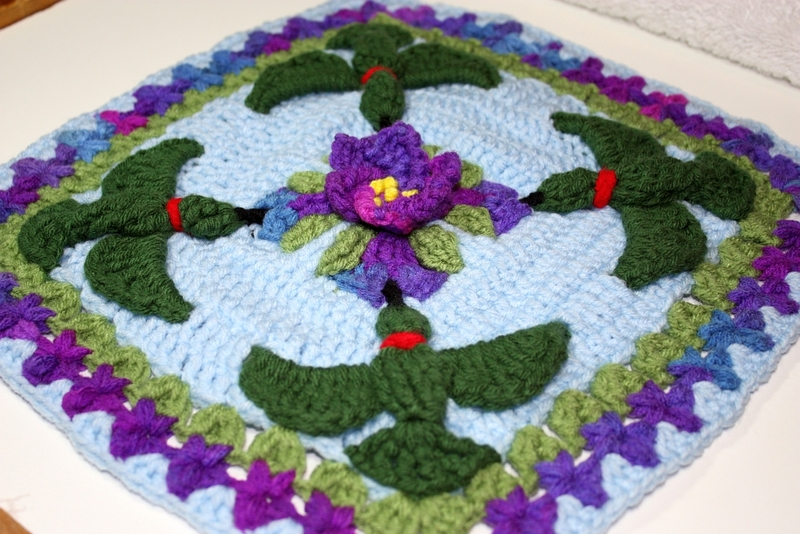 Create a magic circle… or chain four and slip stitch to create a circle, whichever you prefer. Round two (clusters): join yarn into any top of a treble crochet from previous round, slip stitch three (counts as first part of cluster stitch),* yarn over hook, insert into same treble crochet, yarn over hook pull up a loop to match the height of the previous chain three*, keeping all loops on hook repeat from between the asterisks, holding all loops on hook yarn over and pull through all the loops. Chain one. Cluster stitch made. 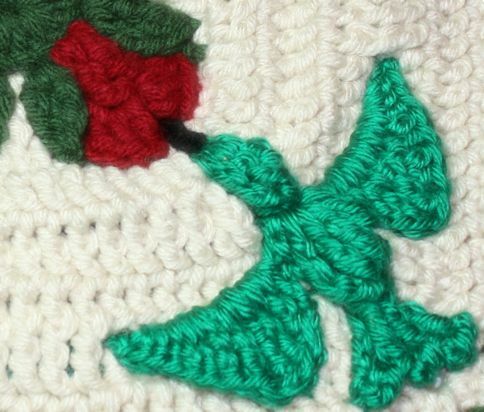 The next petal cluster stitch will not have the first chain three. Using same cluster stitch method, *yarn over hook, pull up a loop* repeat three more times between asterisks, yarn over hook, pull through all loops on hook, so that this makes another cluster in the next treble crochet. Chain one. Continue in this manner around the circle making a cluster stitch in the top of each treble crochet on round one with one chain stitch between them until you have made a total of 18 clusters in every treble around the circle with one chain stitch between each of them. Join with a slip stitch to the top of the first cluster. Finish off. Round three: join yarn into any space between clusters from previous round. Chain 3 (counts as first part of cluster), insert hook into space of previous round where you joined, yarn over hook pull up a loop, yarn over hook pull through two loops on your hook but keeping two loops on your hook unworked, insert hook into same space between clusters, yarn over hook pull up a loop, yarn over hook pull through two loops on your hook keeping now 3 loops on your hook unworked, yarn over hook pull through all three loops (first cluster made). Chain 2. Your next cluster will be made in the space between the next two petal clusters on the previous round. Making a cluster as you did before but omit the chain 3,* insert hook into space, yarn over hook pull up a loop, yarn over hook pull through two loops, leaving a loop left unworked on your hook*, repeat two more times (total of 3 times for each cluster) from between the asterisks, you should now have four loops on your hook, yarn over, pull through all four loops, and then ch 2. (cluster plus chain 2 made) Continue making clusters between the clusters on the previous round below in all 18 spaces around the motif. Chain two between each cluster. After last cluster is made, chain two, and attach with a slip stitch to the top of the first cluster you made on that round. Finish off. 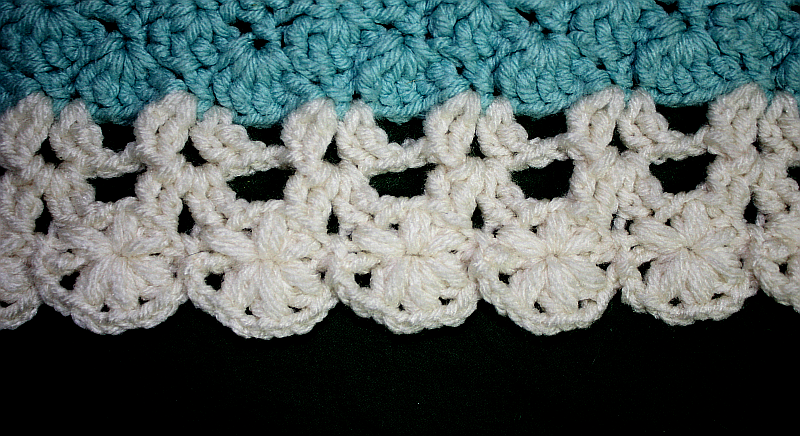 Round four: attach yarn in any space between previous round of clusters, chain three, four double crochet in the same space you just joined in,* three double crochet in the next space between the next clusters on previous round, and again, three double crochet in next space between clusters on previous round, then five double crochets in next space between clusters*. Repeat between asterisks. 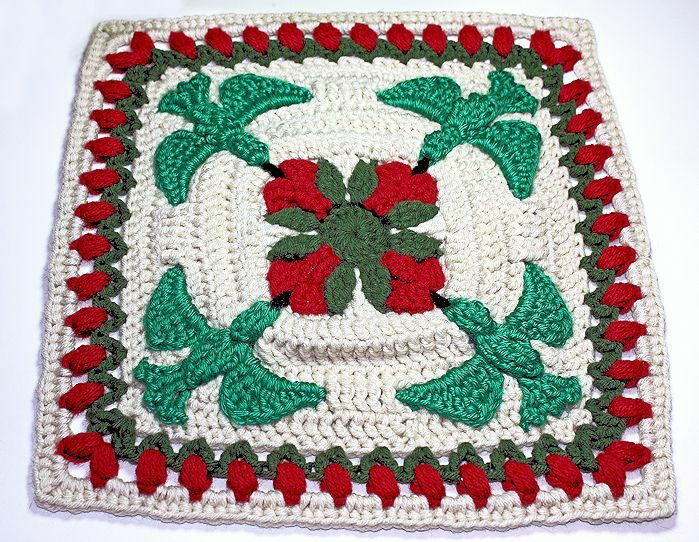 Continue pattern of five- three- three, double crochets in each space between leaves until all 18 spaces are filled and join with slip stitch to first double crochet. Finish off. You will notice this has created your hexagon shape. Joining– this is the tricky part but its easy if you just follow the diagrams below. Holding two hexagons with wrong sides together, you will work a series of single crochets through both pieces at the same time. This not only sews your pieces together to make the slipper, but it gives a nice edging to your entire piece. Line up your stitches so that sections of five double crochets match up on both pieces… so the hexagons are identical over the top of one another. Join yarn in the middle double crochet of a set of five which would be the middle of a hexagon point. Remember to work through both hexagons throughout the joining unless otherwise instructed. Two single crochet in the same stitch that you joined (counts as 3 sc in middle dc of set of 5 on previous round). Continue working through both hexagons, work 10 single crochets across to the next point of hexagons, then work two single crochets in the next double crochet. Unfold the two hexagons while keeping your work intact. Pick up a another hexagon, aligning it wrong sides together along the next edge (see diagram below), line up your stitches the same way you did before, two single crochets through both hexagons in the next double crochet, work 10 single crochets across edge to the next corner, then work 3 single crochets in the next double crochet which should be the middle double crochet of a set of five double crochets which is the corner. DO NOT FINISH OFF. Your piece should look like this: (where the red lines are the row of single crochet that joins both ankle hexagons to the toe hexagon. You will continue this row around the toe section now. 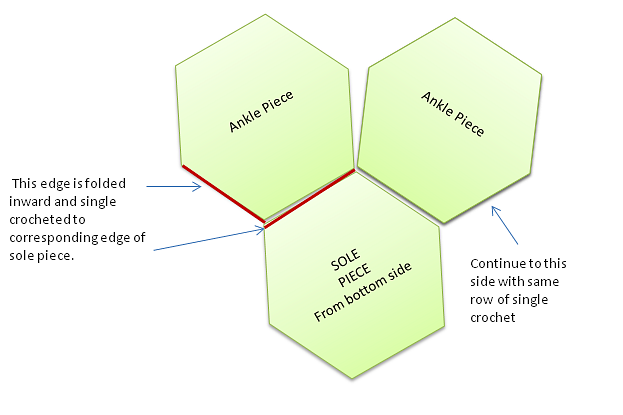 Keeping your stitches intact, align your 4th hexagon to make the sole at the front of the foot. Don’t worry, you will stitch the heel of the sole later. We are just going to attach and edge around the toe & sole hexagons now. 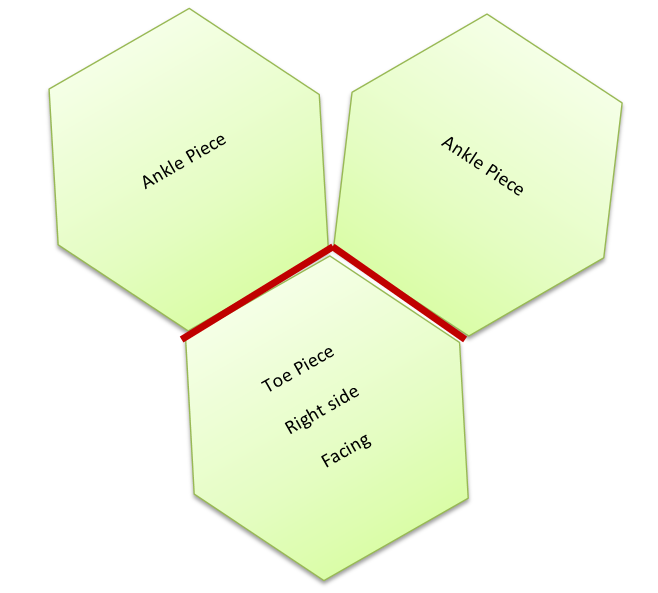 Holding WRONG SIDES TOGETHER with your connected piece (as shown above) on TOP, align your 4th hexagon under the toe so it matches. Make sure your right side of the sole hexagon is facing downward so that you’ve got your wrong sides together toward the inside of your shoe. Now you have to flip the whole shoe over to work on the sole side. 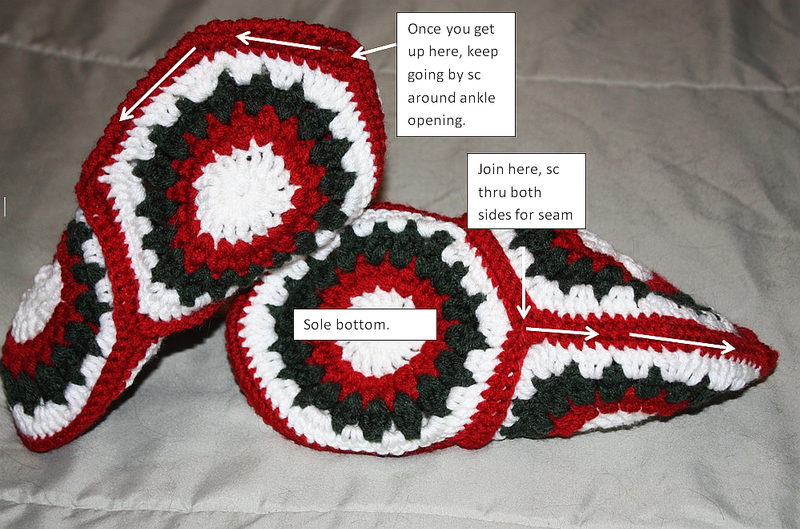 You will make a continuous seam of single crochet edging just like you did for the top part, however this one will make an inverted V underneath the foot on the sole. Continue working in single crochet around the foot opening of the slipper to make a nice edge all the way around the top of your slipper. 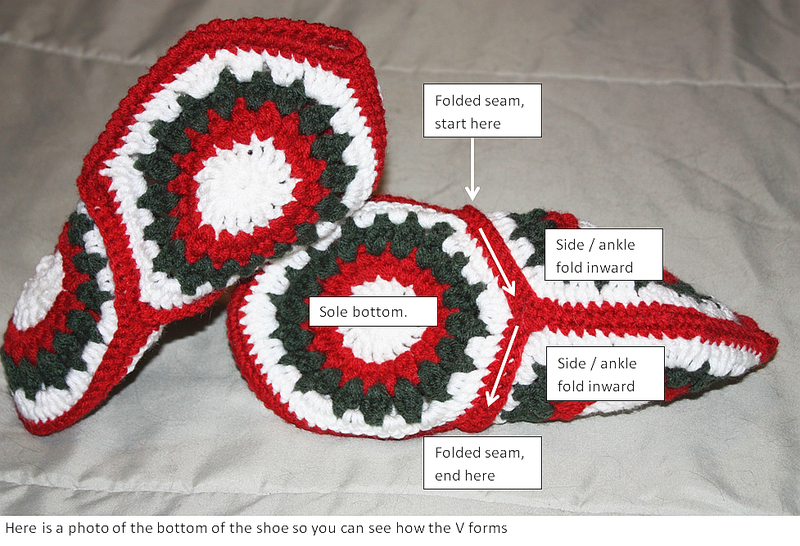 In this photo I have used a reverse single crochet, also called a backward single crochet… however just using a nice firm single crochet around will suffice to create a finishing border on the shoe. If you want the ridged look of the backward crochet stitch you can Google it online and there are tutorials on YouTube galore on how to do it. Note: you can add 2 more hexagons to the ankle area to make ankle booties. Guys tend to like the boots better & the tops can be folded down for even more variation on the boot look. Feel free to make & sell the slipper booties from this pattern but do not reproduce this pattern, publish or distribute it in any way. Note: You will be making two stars then crocheting them together on the last round. After your first star is finished off on round 2, neatly tuck in your tails so the star will be ready to join to your second star. Ch6 (this will count as your first dc, ch3), dc in ring, ch3 (9 times), attach with sl st to 3rd ch at beginning. Ch1, *sc, dc, trc, ch3, sl st in first ch3 (picot made), trc, dc, sc in first ch3 space, 2 sc in next space over*, repeat pattern from * for all remaining spaces around to the beginning ending with 2 sc in last space. Join with sl st to first sc. NOTE: Be sure to tuck in the center bit of loose yarn in your beginning ring or as I like to say “tuck your tail”. Holding both stars together flat with right sides facing out, ch1, working through both layers in the tops of the stitches on previous round *sc 3 across to point of star, at the picot st at the tip of the star point, insert hook through the holes of both picots together and perform sc, ch1, sc, then sc3 across the tops of stitches to the base, sl st twice in the sc from previous round*. Repeat between ** TWICE and do not fasten off. At this point you have joined the two stars around 3 points of the star. Separate the two pieces because now you will only be working on one thickness on the edges of both of the individual stars. *sc 3 across to point of star, at the picot st at the tip of the star point, insert hook through the hole of the picot and perform sc, ch1, sc, then sc3 across the tops of stitches to the base, sl st twice in the sc from previous round*, repeat between ** once… sl st over to the unfinished remaining star being careful to stay working from the outside (right side of work) … repeat between ** twice, sl st into beginning ch1, fasten off and tuck your tail that is left. To apply the topper simply spread the pocket between the stars open and push it down on your tree top. ©ChelseaCraft designs 2012. Distribution limited by permission only.